Breech birth is the delivery of a fetus (unborn baby) in a bottom- or foot-first position. Between 3 to 4 percent of fetuses start labor in the breech position, which is a potentially dangerous situation. Throughout most of pregnancy the developing fetus is completely free to move around within the uterus. Between 32 and 36 weeks, however, the fetus becomes so large that movement is restricted. It is much harder for the fetus to turn over, so whatever position it has assumed by this point is likely to be the same position that he or she will be in when labor begins. For reasons that are not fully understood, almost all unborn babies settle into a head down, or vertex, position. The fetus is upside down in the uterus, and the head will dilate the cervix (or vaginal opening) and lead the way during the birth process. Some fetuses, however, present in a breech position. There are three breech positions: frank, complete, and incomplete. In a complete breech, the buttocks lead the way out of the uterus, and the legs are folded in front of the body. A frank breech baby also has his buttocks down, but his legs will stretch straight up with his feet by his head. An incomplete breech, also known as a footling breech, presents with one or both legs down so that the feet drop into the birth canal at delivery. Of course, many babies are safely delivered from the breech position. There are certain factors that make a breech delivery more likely to be Successful; if ultrasound (a technique that uses sound waves to visualize the fetus) shows that the fetus is in the frank breech position, the fetus's chin is tucked on its chest, and the fetus is not big, it is more likely that an uncomplicated breech delivery is possible. The biggest part of the fetus's body is usually its head. If the head fits through the mother's pelvis, then the rest of the fetus's body should slip out fairly easily. In addition, when the baby's head comes first, the soft bones of the skull "mold" to the shape of the birth canal during labor (which is what gives newborns that cone-headed appearance). If the fetus is born bottom first, it is possible that the body will fit through the mother's pelvis, but the baby's head will get stuck at the level of the chin. This condition, known as a entrapment, has the potential to cause serious injury to the fetus, and surgical intervention may be required to complete the birth. Approximately 3–4% of babies will start labor in the breech (buttocks first) position. While this is a potentially dangerous situation, many full-term babies can be safely delivered from the breech position. off the blood and oxygen supply. This situation is known as cord prolapse. Breech presentation occurs in 3 to 4 percent of all births, and up to 95 percent of women with a breech fetus choose cesarean section for birth. The earlier a birth occurs in pregnancy, the higher the chances are that the fetus will be in a breech position. Twenty-five percent of premature infants born before 28 weeks are breech. The cause of breech birth is not known. Women with multiple gestations (i.e., twins or more) are more likely to have at least one fetus in a breech position simply due to space constraints in the womb. There are generally no identifiable symptoms of a breech fetus. However, some women may be able to detect the position of the fetus by where they feel the fetus kicking. A healthcare provider can often tell the position of the fetus by feeling it through the wall of the mother's abdomen. Another clue to the position is the location where the heartbeat is heard best. If the fetal heartbeat is best heard below the level of the mother's navel, it is likely to be positioned head first. On the other hand, if the heartbeat is best heard above the level of the navel, it is likely to be breech. The most accurate way to determine breech position is using ultrasound. If a fetus is in the breech position in the last weeks of pregnancy, there are three possible courses of action: cesarean section (or c-section), attempted external cephalic version, or vaginal breech delivery. Some women choose vaginal breech delivery. This should only be attempted if ultrasound shows that the fetus is in a favorable breech position. The frank breech position is the preferred position for successful vaginal breech birth, and the majority of breech fetuses are in this position. Most babies will do very well during a breech delivery, but there is a risk of fetal injury. Some providers may use forceps or a vacuum extraction device to help a breech baby out of the birth canal, a procedure known as assisted breech birth. During an external cephalic version (also known as version), the obstetrician attempts to turn the fetus to a head first position before labor begins by manipulating the outside of the abdomen. The obstetrician places his or her hands on the mother's abdomen to feel the location of the unborn baby's buttocks and head. The buttocks are lifted up slightly and the doctor pushes on the baby's head to encourage him to perform a sideways somersault. It may take several tries before the fetus cooperates, but about half will eventually turn. A version should only be done in a hospital, with an ultrasound machine used to guide the obstetrician in turning the fetus. The fetus should be monitored with a fetal monitor before and after the version. The mother is given medication to relax the uterus, minimize discomfort, and prevent premature contractions. Cesarean section is the most common way to deliver a breech baby and is the method recommended by the American College of Gynecology and Obstetrics if a version has failed. A c-section is performed by an obstetrician, who makes an incision in the lower abdomen through which the baby is delivered. Like any surgical procedure, c-section carries a risk of infection and hemorrhage. Postpartum recovery is also longer with c-section than with vaginal delivery. However, in difficult breech presentations, or in cases where there are multiple fetuses and one or more are breech, it may be considered the best option for delivery. Version is successful in turning a breech baby approximately 50 percent of the time. However, some babies who are successfully turned will turn back to the breech position after the procedure is done, particularly if version is attempted too early before the onset of labor. Manipulations to deliver an entrapped head or stuck shoulder or arm can cause injury to the baby. Both entrapment and cord prolapse can be potentially fatal to an infant if delivery is delayed. Among breech babies born after the full nine-month term, smaller babies usually do better. The exception to this is premature babies. C-section is generally the delivery mode of choice for premature babies due to the other risks these infants face (such as lung immaturity). There is no way to prevent a fetus from settling into the breech position at the end of pregnancy. A woman who has had one breech fetus is at an increased risk for having another breech fetus in subsequent pregnancies. 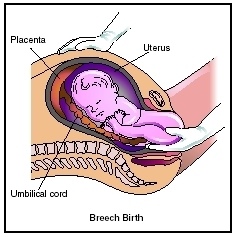 Complete breech —A breech position in which the baby is "sitting" bottom first on the cervix with legs crossed. External cephalic version —Manual manipulation of the abdomen in order to turn a breech baby; also known as version. Frank breech —A breech position where the baby is bottom first and his legs are extended upward so that his feet are near his head. Incomplete breech —Also called a footling breech, in this position the baby has one or both feet down towards the pelvis so that his leg(s) are poised to deliver first. Umbilical cord prolapse —A birth situation in which the umbilical cord, the structure that connects the placenta to the umbilicus of the fetus to deliver oxygen and nutrients, falls out of the uterus and becomes compressed, thus preventing the delivery of oxygen. Vertex —The top of the head or highest point of the skull. See also Cesarean section ; Childbirth . Ford-Martin, Paula. The Everything Pregnancy Book , 2nd ed. Boston, MA: Adams Media, 2003. Moore, Michele. Cesarean Section. Baltimore, MD: Johns Hopkins University Press, 2003. Gaskin, Ina May. "The Undervalued Art of Vaginal Breech Birth." Mothering no. 125 (July-August 2004): 52–9. Sachs, Jessica Snyder. "C-Sections by Choice." Parenting 18, no.2 (March 2004): 22. March of Dimes. 1275 Mamaroneck Avenue, White Plains, NY 10605. Web site: http://www.marchofdimes.com. "Breech Birth." Available online at http://www.babycenter.com/refcap/pregnancy/childbirth/158.html (accessed November 9, 2004). Goer, Henci. "Scheduled cesareans: The best option for breech babies?" Available online at http://www.parentsplace.com (accessed November 9, 2004).